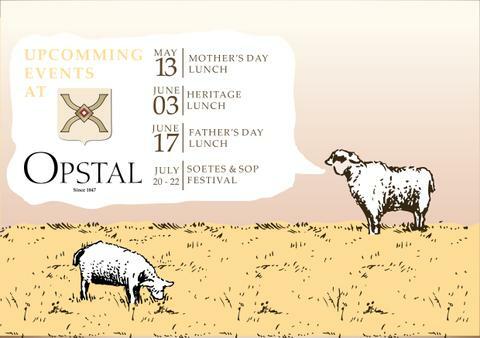 Spoil mom with lunch at Opstal Estate, in the heart of the picturesque Slanghoek Valley. 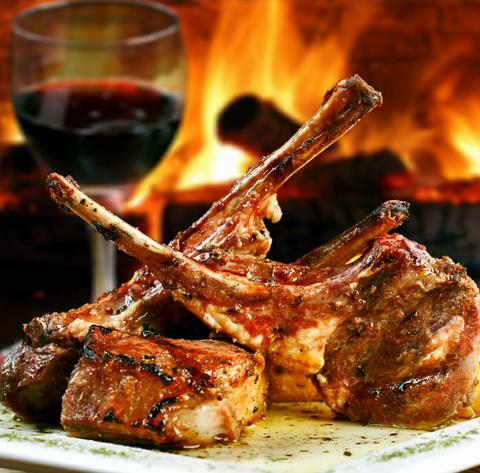 Enjoy our buffet feast - from a traditional leg of lamb and seasonal vegetables to chorizo chicken and blueberry cheesecake with berry ice cream. Join us on Sunday the 15th and 29th of November and the 6th and 13th of December for Live Music! 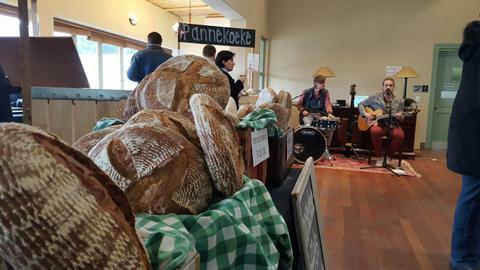 El Keen, a well-known artist from Stellenbosch and local artist Alan Baadjies, will provide all the flavour one needs for summer. Lunch visitors will be welcomed with complementary homemade cheese bread, topped with sundried tomato pesto and paired with a glass of Mill Iron, our perfect, award winning, ‘food wine’. The Mill Iron combines the ripe flavours and structure of the Viognier, the fresh, floral Muscat notes and the perfume and acidity of the Colombar. 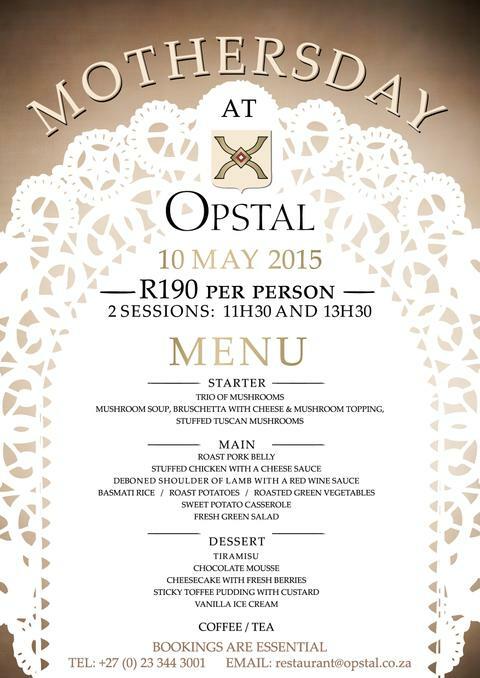 Opstal Estate and Restaurant offers the perfect escape to relax and socialize with family and friends. Our popular platter for two, with a selection of Cheese, Parma Ham and green figs, to name but a few, are also available to order as well as our traditional Sunday menu. Wine tasting is open Monday to Friday, normal wine tasting hours, from 9am to 5pm. Weekends and public holidays from 11am to 3pm. The Restaurant is open from Wednesdays to Sundays, 9am till 5pm. Sixpence going for double gold at Ultra Value Wines! 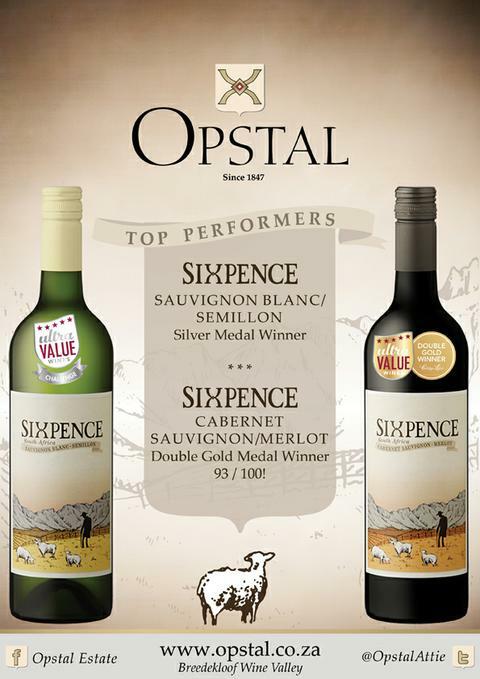 Sixpence Cabernet Sauvignon/Merlot – Double Gold with a score of 93/100! Congratulations to the entire wine making team at Opstal, we are proud. 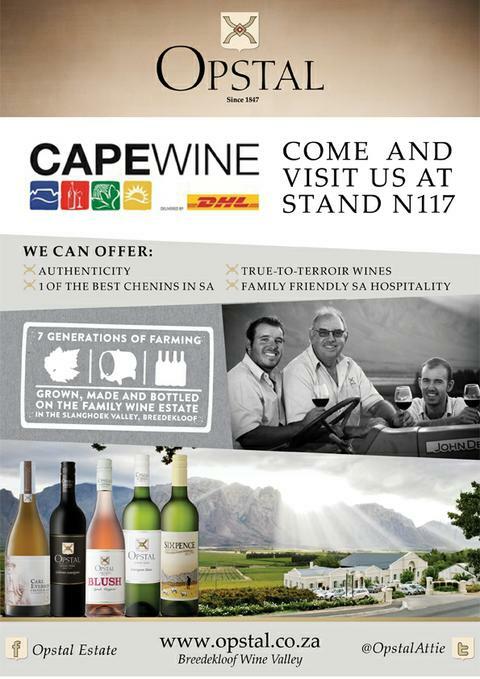 Cape Wine is the flagship business showcase of the South African wine industry. 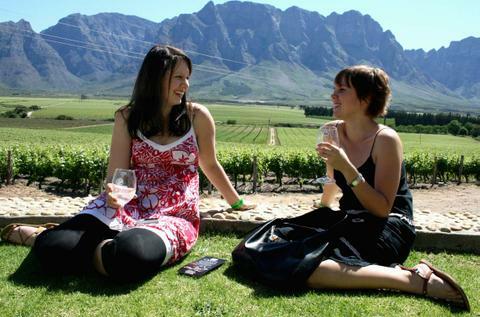 Presented at the Cape Town International Convention Centre every three years by Wines of South Africa (WOSA), it is the most successful international wine trade show in the southern hemisphere. Opstal will be there, from 15-17 September and we’re looking forward to making great new international contacts as well as to strengthen existing ties, all in an effort to grow our Opstal brand internationally. 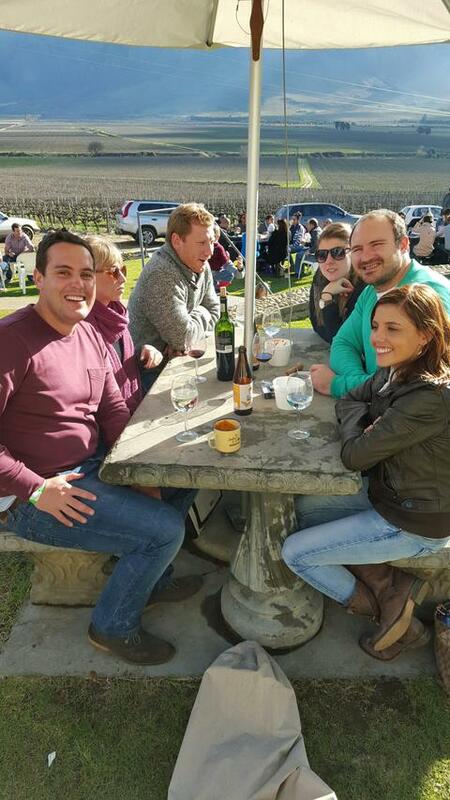 Soetes & Soup Festival 2015 - a huge success! 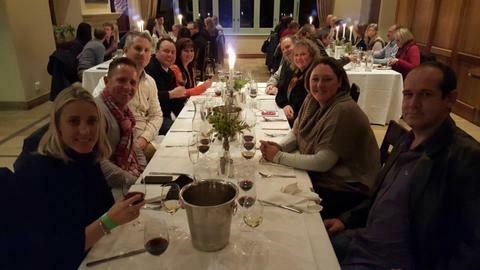 This year’s Breedekloof Soetes & Soup Festival was again a huge success. 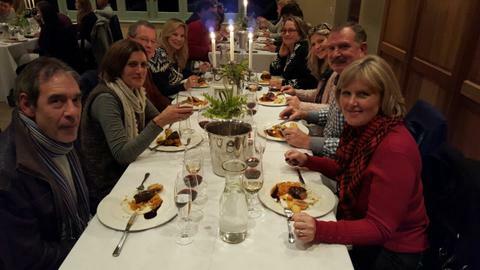 The visitors to Opstal thoroughly enjoyed themselves and was able to attend a Food & Wine Dinner, stroll through our family market, taste our wines, warm-up with our sundried tomato soup and just enjoy the magical views of the Slanghoek mountains. We thank all who attended and hope to see those that missed out this year next time. 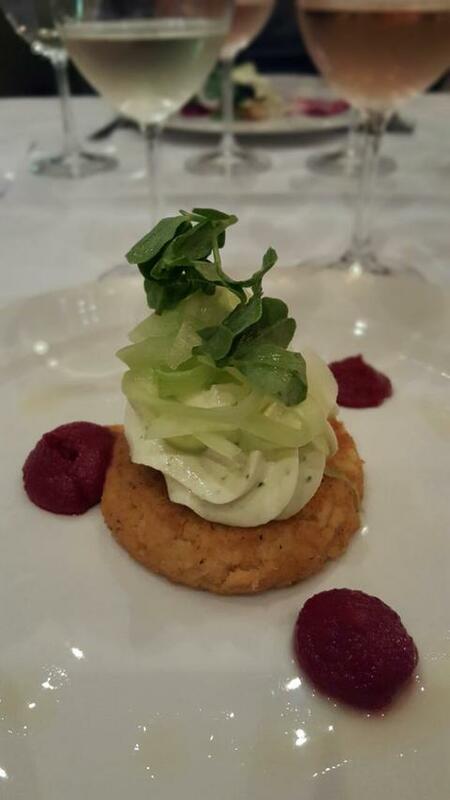 During our Breedekloof Wine Valley’s annual Soetes & Soup Festival we will be hosting a special Food & Wine Dinner at our Estate Restaurant. 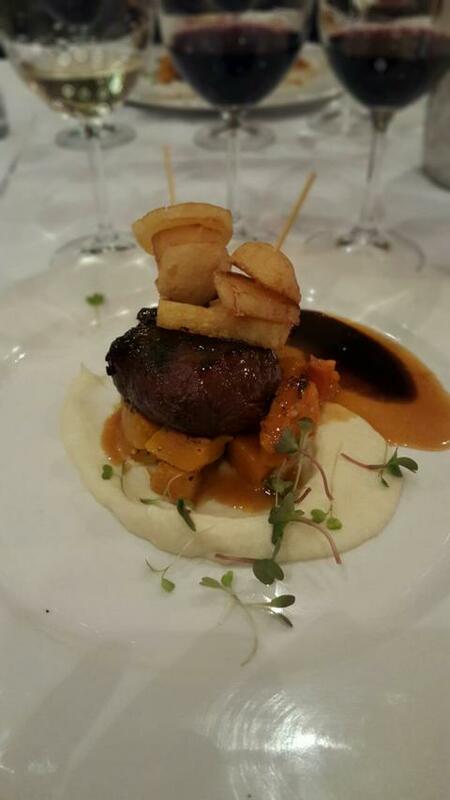 Our winemaker, Attie Louw will guide you through the evening, pairing our estate’s great wines with gourmet dishes prepared by our kitchen. 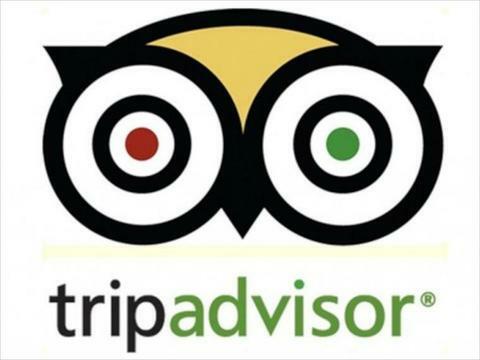 It is essential to make a reservation as we will only accommodate a limited amount of guests. 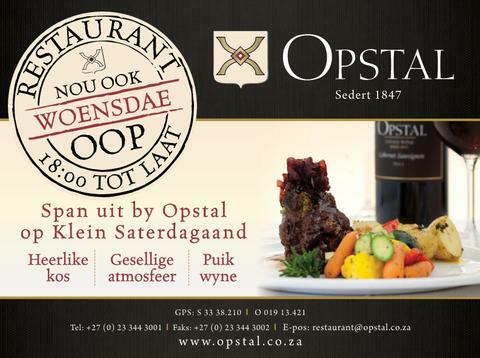 Bookings can be made via email at restautant@opstal.co.za or by calling us on 023 344 3001. 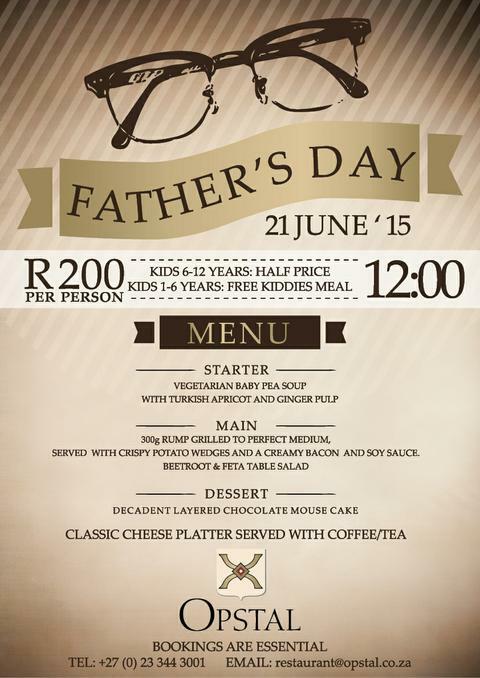 Spoil dad this Sunday (21 June) with a delicious 3 course meal and with cheeses and coffee on top of that as well. We’re normally very busy so contact us soon to avoid disappointment. 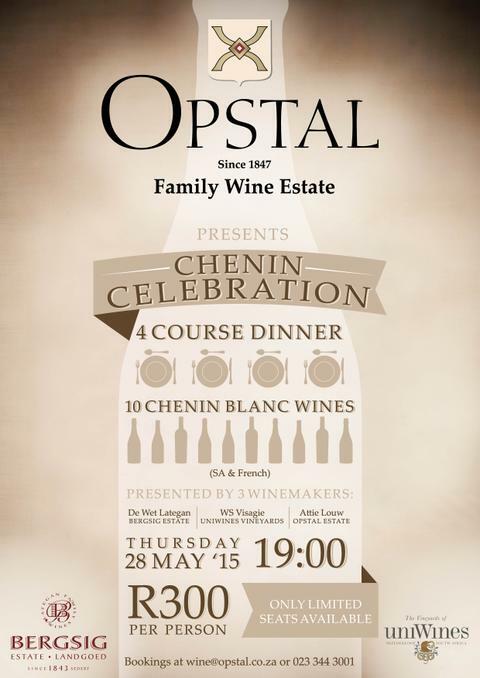 Join us for the Chenin Celebration at Opstal Estate and Restaurant on 28 May 2015! 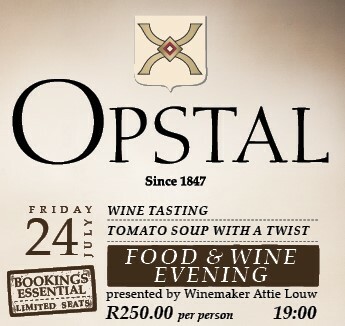 The evening includes a carefully selected 4 Course Meal and 10 Chenin Blancs, both local and French, presented by Winemakers’ Attie Louw (Opstal Estate), WS Visagie (Uniwines Vineyards) and De Wet Lategan (Bergsig Estate). R300 per person. BOOKING IS ESSENTIAL as there are limited seats available! 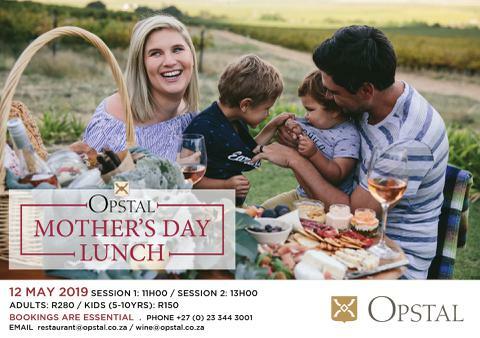 It’s that time of year again to especially spoil mom and what better way than a scrumptious meal and lunch celebration at Opstal Restaurant! 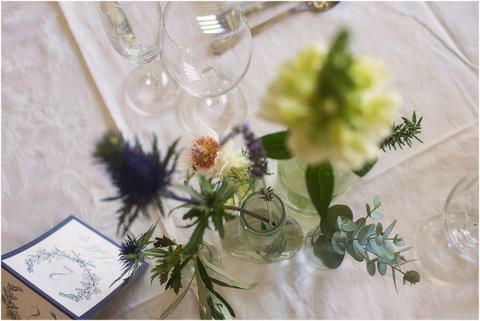 Be sure to book in advance as our tables get filled very quickly for the day. 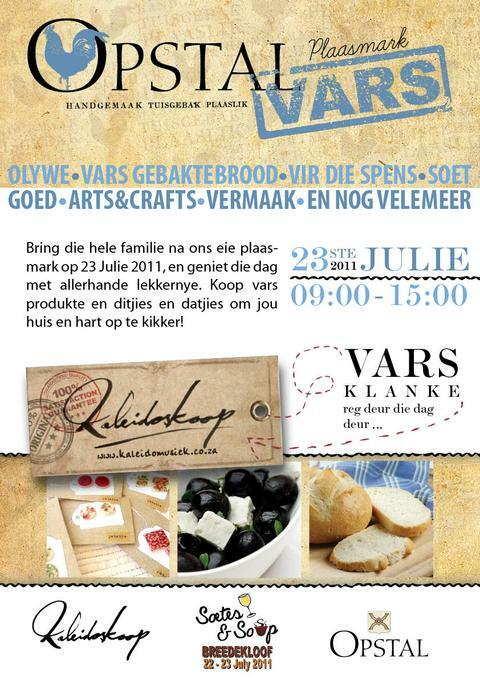 Our ever popular farmers market, Opstal Vars will take place on Saturday the 19th from 09:00 - 15:00. Opstal Vars is a place where fresh produce, fresh ideas & people meet. 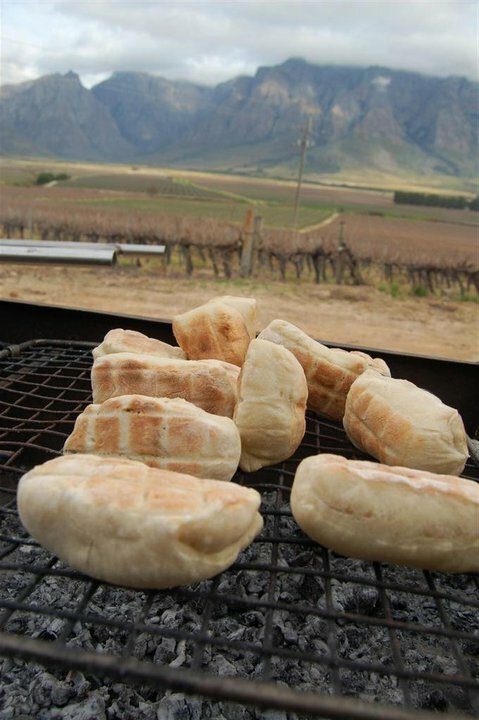 Stalls include gourmet roosterkoeke, pizzacones, biltong, pesto’s, cupcakes and the best coffee in the valley. 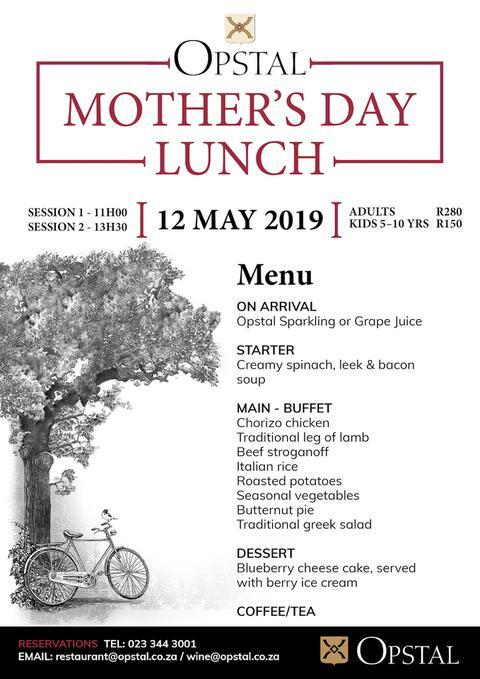 This all with a free cup of our Roasted Tomato soup and wine tasting promises for a great day out with the whole family. What a weekend we’ve got lined-up for all dads out there. 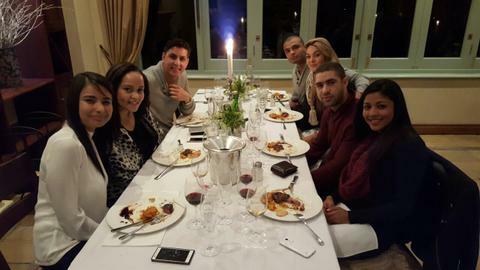 It’s the start of the Soccer World Cup, the Boks take on the Welsh and it’s the Gholf US Open. But, man is man and man must eat… So bring dad for a delicious meal on Sunday at our restaurant. 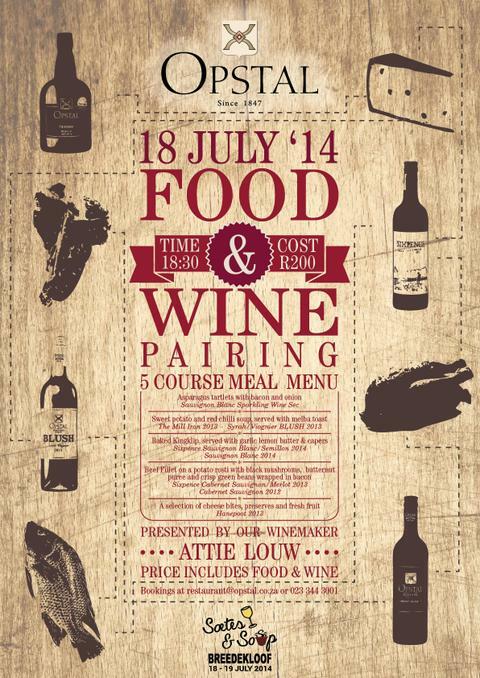 Booking is essential and costs R180 per person. 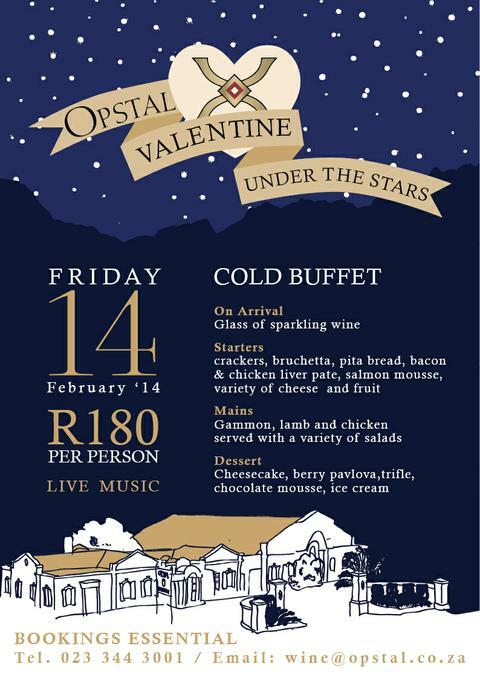 Contact 023 344 3001 or restaurant@optal.co.za for more information or to secure your table. We’ve put together a special menu for these evenings and, on opening night, Wednesday September 4th, we will be pouring welcome drinks to all diners. 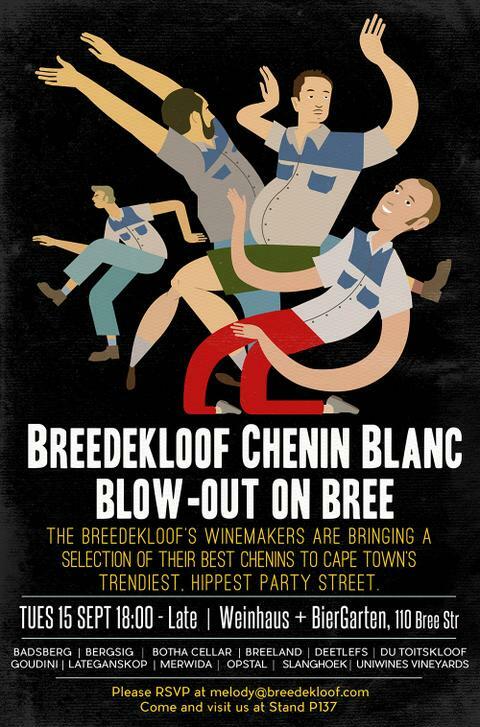 On 13 October 2012 it’s time again for the Breedekloof Wine Route’s annual Outdoor & Wine Festival. Our popular farmers market, Opstal Vars will be running with loads of stalls showing/selling tasty fresh produce, funky designer accessories and plenty of fun for the kids. Enjoy our well known Blush wine which will be paired with the freshest SUSHI, prepared by sushi chef Lam Malakhan. 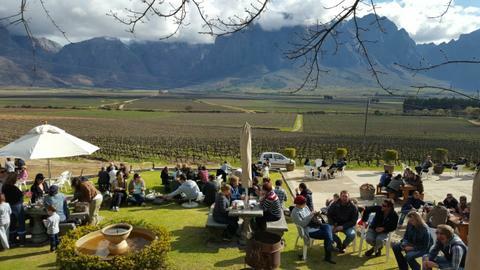 Buy your festival pass for R60 at any winery in our area. Slanghoek Primary is a rural school in our valley that serves the community of Slanghoek, with many learners coming from impoverished homes in the area. Established more than 50 years ago by the local Nederlands Gereformeerde Kerk, the school has grown from strength to strength and currently boasts 10 teachers and 268 learners. The school continues to excel with the assistance of the local farming community and the involvement of not only their beneficiaries, but also programmes such as the Khanya Project which established the school’s computer laboratory. This enabled students to gain access to computers in the hope to develop skills in technology that will allow them to gain skilled employment and so not only send computer literate learners into the future, but assist in breaking the cycle of poverty. The Slanghoek Wheelie Wagon initiative is a further addition to the school. This project enhances the exposure to the world of books, not only to learners but also adults from nearby farms. Farmers are often criticized in the media for all the wrong reasons; however, in Slanghoek this is not the case as is evident of their active support at Slanghoek Primary. This small community school is the catalyst towards farmers and farm workers combining capital and manpower to improve the community. 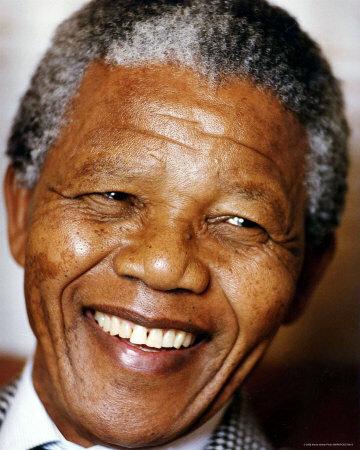 Now the school and the community once again come together to celebrate Mandela Day on 18 July 2012 – a day traditionally viewed as an opportunity to plough back into the community. Celebrations will be opened by Minister O’ Kennedy at 09h00, which will be followed by various speeches by community leaders. At 12h00 the school has the privilege of hosting the elderly for lunch and a spot of tea. The rest of the day will be spent on the maintenance of the school buildings and grounds where town locals, farmers and scholars will all come together in unity and harmony, cementing relationships and forging new friendships. We will be there and will be taking photos to report back the work done! The 29th will be a private party, but the 14th is open for all lovebirds out there. 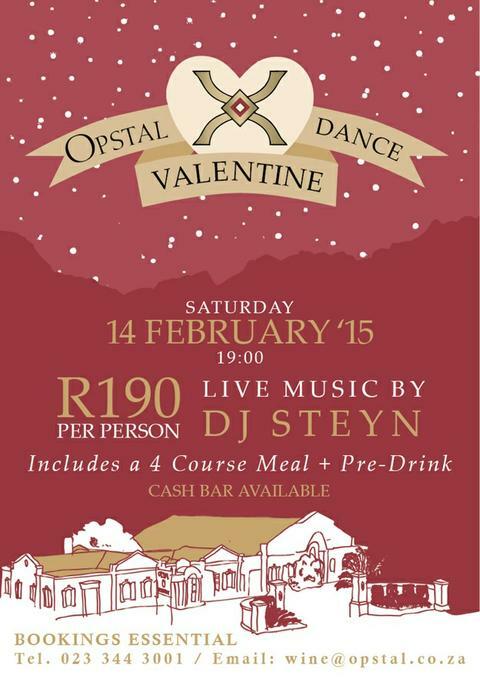 So make Opstal your romantic venue of choice. 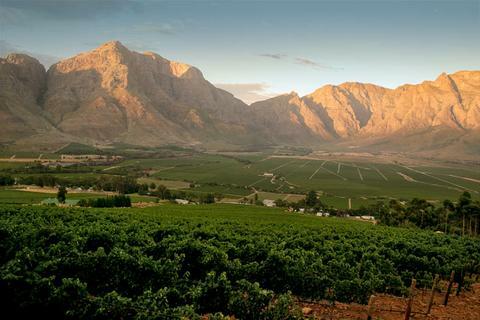 Our winemaker will present a wine tasting at sunset with the majestic Slanghoek mountains as a backdrop. 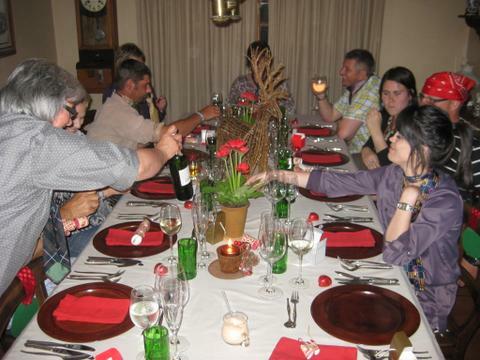 Thereafter you can sit down and enjoy a fantastic 2 course A la Carte meal. All of this for R150 per person. 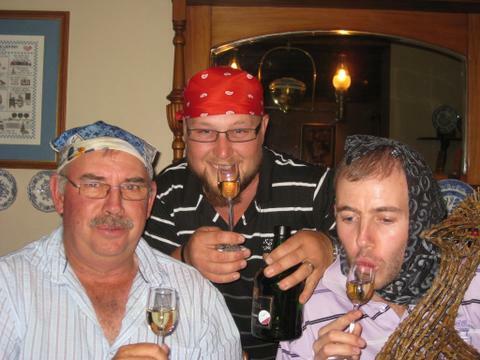 This week we (Opstal Management Team) held our annual Christmas Party. As usual mom/restaurant manager/wedding coordinator, Ria, WOW’d us with delicious food - including Salmon & cream cheese rolls, cheese truffles, carpaccio salad and chicken kiev. 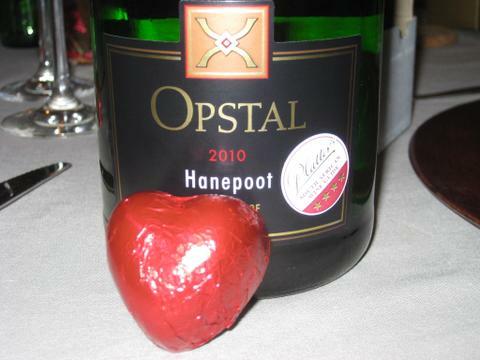 On a joyful night we also celebrated our Platter (2012 edition) 4 star rating for our 2010 Hanepoot, which went extremely nice with the assortment of chocolate yummies for dessert. 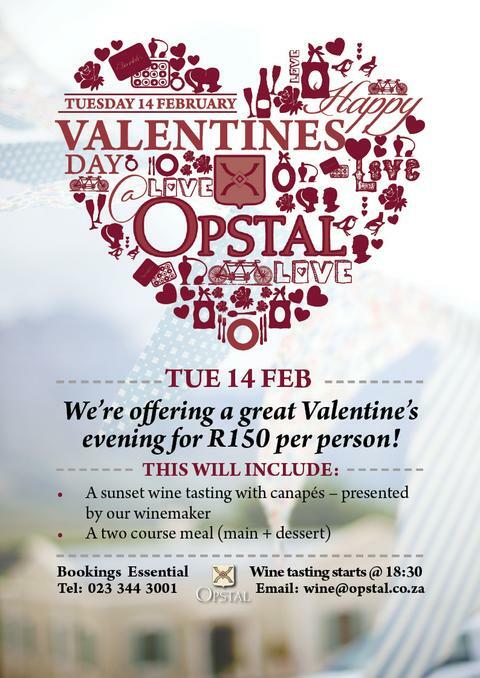 So, at the end of a year in which we still find the wine industry struggling, we at Opstal have lots to be thankful for. With good health, wine and food on the table and the privilege to work in the most picturesque office in the world… it’s not all doom and gloom! Merry Krismis and festive season to all. 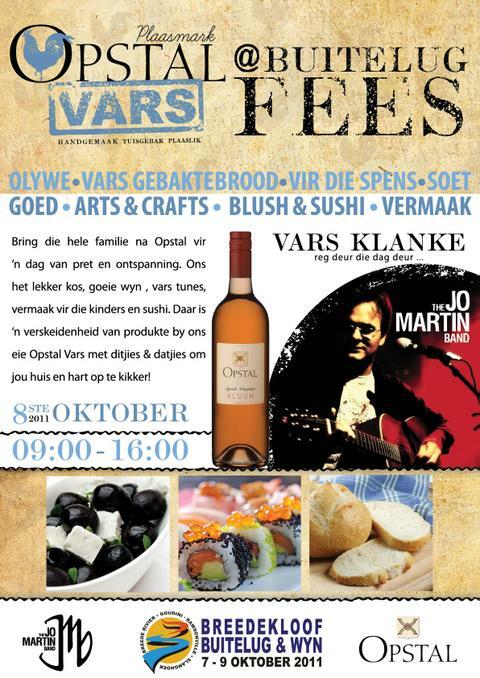 After the successful launch of Opstal Vars in July we didn’t think twice about getting all the exhibitors back for round 2 at this year’s Breedekloof Outdoor & Wine Festival from 7 – 9 October. 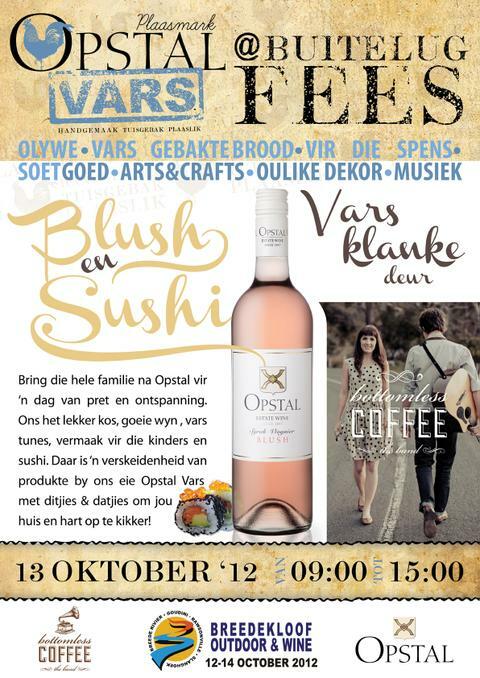 Opstal Vars - a meeting place for fresh produce, fresh ideas and of course fresh people – will have an extra twist in October – sushi chef Lam Malakhan and her team will prepare freshly made sushi throughout the day, paired with our very popular Blush. Jo Martin will perform lekker tunes for the festival atmosphere and with a jumping castle the kids are sorted as well. 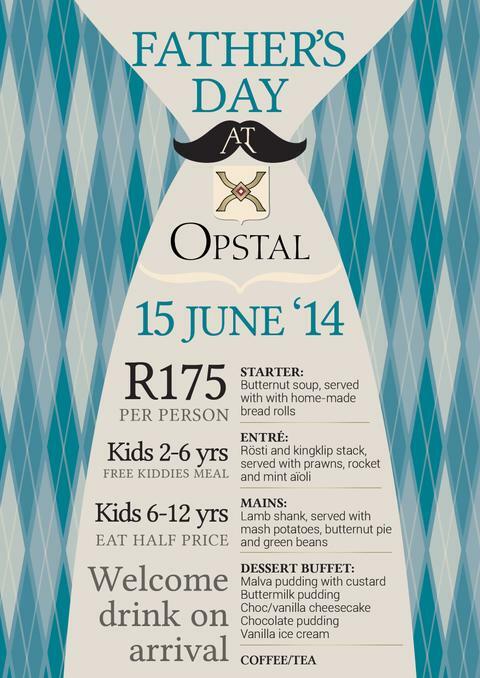 So join us for a family friendly day of fun, because oh yes… Opstal is home to everyone! 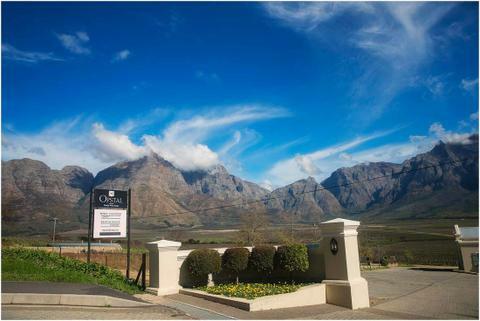 A first at this year’s Breedekloof Outdoor & Wine Festival at Opstal will be an exhibition by Quenet’s Hunting & Fishing of their bow hunting, paintball and air gun equipment. They will also set-up a cool target shooting course where you can aim and try your luck in an attempt to win great prizes. Remember… Aim small, Miss small! This course/exhibition will be set-up next to our winery and restaurant where Opstal Vars (our fresh farmers market) will also happen on the same day. Sounds like fun…? 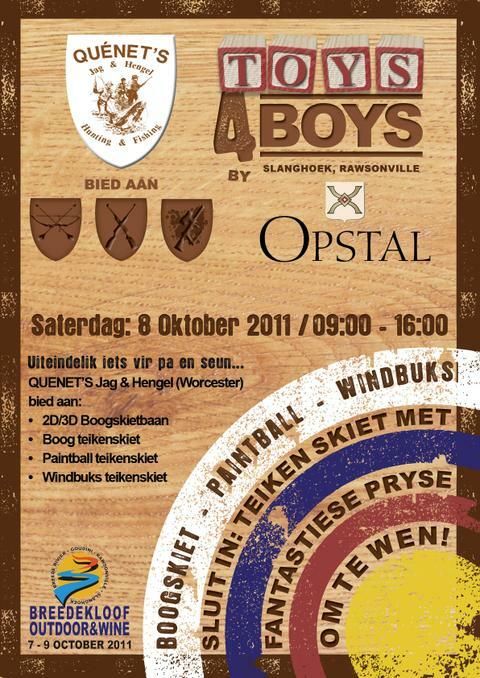 Come join us on 8 Oct 2011. 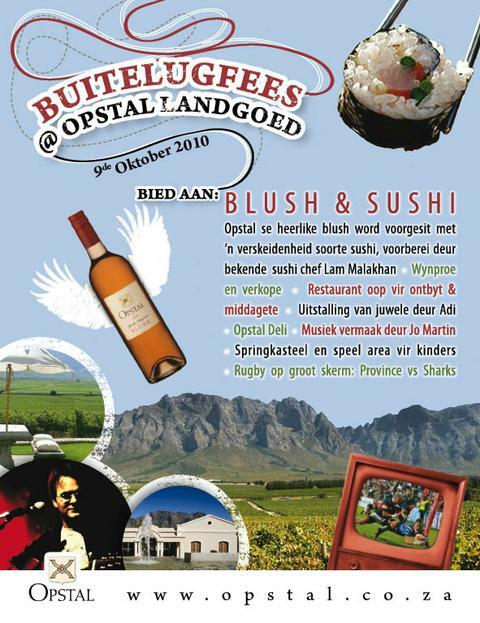 On the 23rd of July 2011 Opstal will host its 1st farmers market as part of this years’ Soetes & Soup festival in the Breedekloof valley. This will however not be any farmer’s/fresh market – we call it Opstal Vars (Opstal Fresh). 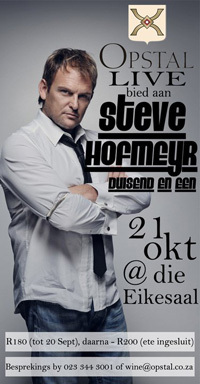 …is besig om vere reg te skud en partytjie skoene af te stof vir Superstar Steve Hofmeyr wat Donderdag Opstal Live tot die next level vat…!!! 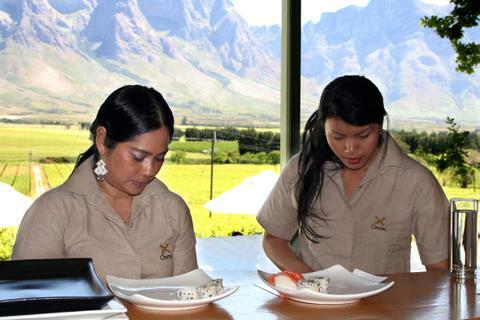 At the 2010 Breedekloof Outdoor & Wine Festival we brought the sushi and Blush and thankfully all our guests brought the gees! 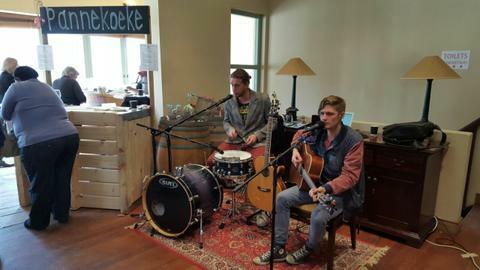 It was a perfect Spring day in the Slanghoek valley and with the mellow tunes from Jo Martin and his band the food and wine went down smoothly. Kids had fun in the playgym and on the jumping castle and the family day atmosphere was felt and enjoyed by all. 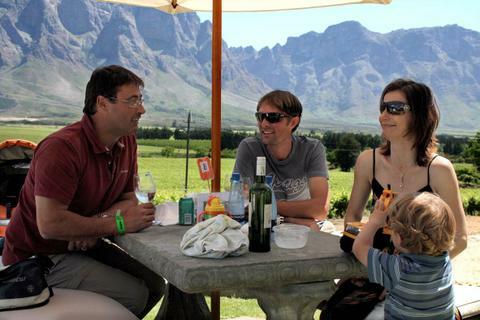 See you all again next year in October at the 2011 Outdoor & Wine festival where Opstal will most certainly again be the place to be for good food, good wines and great times…!